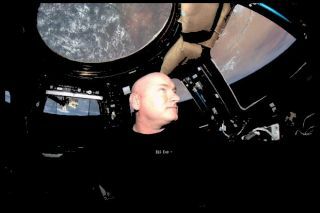 Scott Kelly, shown aboard the International Space Station, answered questions from space via Twitter, on Saturday, Sept. 19. Scott Kelly just started the second half of the longest consecutive space mission a NASA astronaut has ever completed. To celebrate, he took to Twitter to answer questions from curious space enthusiasts on Earth. "Entering the unknown on the 2nd half of my #YearInSpace," he wrote in a tweet on Thursday (Sept. 17). "Got Qs for me? Let's chat!" Kelly began answering questions at 1:45 p.m. EST (1745 GMT) on Saturday (Sept. 19). For the most part, questions revolved around an astronaut's typical day aboard the International Space Station. @Mc_Steezy asked, "How many backflips can you do in a row in space?" @CodyMJohns asked, "What's the hardest thing to do in space we take for granted with gravity or on Earth?" Floating in microgravity for a year might seem fun, but it has its downsides. Even six months in space can lead to muscle and bone loss, because a body that doesn't have to fight against gravitational forces weakens from underuse. A question about exercise aboard the ISS reveals more about how astronauts stay fit. Scott Kelly has dedicated his life to furthering space exploration. By the end of this mission, he will have spent a total of about a year and a half in orbit. But questions about Kelly's experience aboard the ISS reveal that he actually prefers it when his feet are planted on the ground. @JakeNonnemaker asked, "Would you go to Mars if given the opportunity?" @kyleiop asked, "Which one do you like? Living in Earth or in space?" @GretelRot asked, "In what way did a #YearInSpace change your perception of life/time/anything else, or what DID change for you?" In addition to how they keep themselves clean, astronauts' sleeping habits were of key interest to questioners. @Rijul_Reji asked, "What kinda dreams do you see these days?" @jccozzi asked, "After half a year in space, do u think humans are mentally well-suited to be able to travel 2 Mars? Would we miss 2 much?" @GrahamTeacher asked, "What advice would you give to the next person spending a year in space?" @katie11074 asked, "How do you get the food that you eat?"